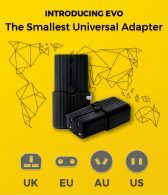 Evo is the smallest global travel adapter on the planet, offering unprecedented reliability at a price you can afford. As large as a packet of mints, this adapter can make power connections work for your electronics, even those powered by USB, in over 150 different countries. With a few twists and turns, it can convert from a US socket to a European, British or even Australian socket. That is four different types of sockets in one! If you travel often, you might already own a bulky or heavy adapter that you would like to downsize. Or, you may have more than one adapter for each type of socket you need for your travels. And it isn’t uncommon for travelers to mistakenly grab the wrong type of adapter. But with Evo, these concerns will no longer be yours to deal with! No matter where your next destination is, you only need one small adapter to be fully prepared. This is a super-compact adapter that can fit in your pocket, bag, pouch, or anywhere you would like to store and carry it! Made of PC94V0 plastic, it is also light, yet unbreakable and fire resistant. No matter what you do on your travels, recharging your phone is essential, so whether you visit different countries for business or globe-trot to see various wonders, Evo can be relied upon for all your charging needs. At under $20 each, get your very own Evo on kickstarter and stay connected wherever you may go.